In Sunlight or In Shadow is made up of 17 authors and edited by Lawrence Block. 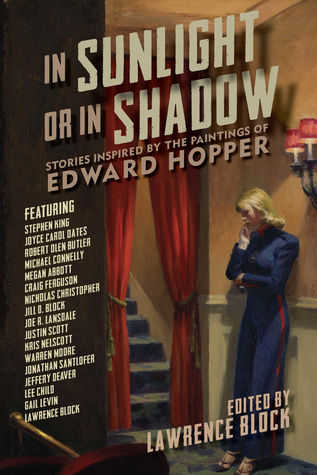 This short story collection is inspired by the paintings of Edward Hopper. Each story in this book is uniquely different, which makes this book enjoyable. The authors who collaborated on this project span the genres. These stories are hit or miss. There are a few stories that I really enjoyed, but there were some stories that I couldn’t make it through. Stephen King, Lee Child, Joe R. Lansdale, Jeffery Deaver, and Craig Ferguson all wrote great stories. This isn’t really a horror book, but Stephen King’s short story is one of the best he has ever written. I don’t know if I would buy this book, but I would certainly buy a few of the short stories if they were sold separately. I’m being kind of generous with my review. I highly recommend the Stephen King short story to fans of horror!